Bosch Sensortec’s BMX160 is a 9-axis motion sensor touted as the smallest in the industry for wearable and augmented/virtual-reality devices. The miniature device is housed in a 2.5×3.0×0.95-mm, 14-pin LGA package, small enough for smartphones, smart watches, fitness trackers, and even smart eyewear and jewelry. 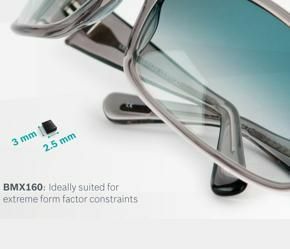 Combining an accelerometer, gyroscope, and geomagnetic sensor, the BMX160 meets the increasingly more stringent low-power requirements required by wearable devices. The BMX160 reduces power consumption to below 1.5 mA and effectively replaces the mainstream two-component design, which employs a 6-axis inertial measurement unit and a 3-axis geomagnetic sensor. The 3-in-1 device enables the power-hungry application processor to remain in sleep mode longer, for example when counting steps, further extending battery recharge intervals. The BMX160’s integrated step counter function and the Android-compatible motion detector consume just 30 µA each. Built-in hardware synchronization of the inertial sensor data and geomagnetic sensor data makes the BMX160 useful for augmented reality, immersive gaming, and navigation applications that require high accuracy, low power and low latency 9-axis sensor data fusion. The device has a VDD range of 1.71 V to 3.6 V and a VDDIO range of 1.2 V to 3.6 V, allowing it to be powered at 1.8 V for both VDD and VDDIO.